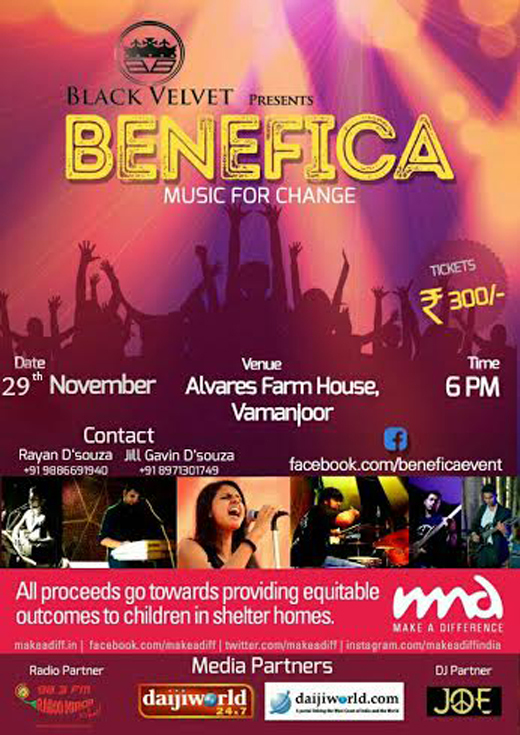 Mangaluru, Nov 29, 2015: Kudla’s own rock band "Black Velvet" will give Gen Next a chance to be MAD ’Make A Difference’ ; "Benefica", a fund raiser at Alvares Farmhouse at Vamanjoor Nov 29, at 6 pm. A youth-driven, non-profit organization, music loving youth attending the charity show will not only ensure that they enjoy grooving to some chill-worthy sound tracks, but also ensure their contribution helps MAD financially. Together with MAD, Mangaluru, Black Velvet aims to make Benefica an event like no other. Benefica is a huge departure from humble fundraisers that MAD, Mangaluru has organized before. "Benefica is bigger, bolder and better than anything before," noted Anna Crasta, city team lead for MAD, Mangaluru. Highlighting special performance by the dance crew ’Friction’. There will also be food stalls to satisfy one’s gastronomic cravings. "Benefica" is essentially an event dedicated to the community - an event to celebrate Mangaloreans as folks who are truly capable of giving back to the society. Gains of the charity will go to the children at risk in shelter homes across Mangaluru, Anna Crasta said. To gain entry to the fun-filled event, one may call 9886691940 to obtain advance passes. Early-bird tickets are priced at Rs.300. Rayan D’Souza of Black Velvet said band members consist of fresh-faced youths - Ria D’Souza and Danny J on vocals. Rayan himself plays the keyboard with Jill D’Souza on drums Joswin D’Cunha on lead-guitar and Floyd Pereira on bass. The band revives tracks ranging from pop, rock and funk to EDM. The proceeds will go to MAD, Mangaluru who are currently working with three shelter homes across the city, he said, adding the band is glad to contribute too.